PHOENIX — Ryan Braun has never been a fan of spring training, but he’ll have plenty of work to keep him busy this year. The Milwaukee left fielder reported to camp Monday to prepare for his 12th big league season. And for the first time since his rookie campaign in 2007, he’ll be taking groundballs as the Brewers try to get him work at first base. Moving Braun became an option when Milwaukee acquired outfielders Lorenzo Cain and Christian Yelich in January. Their additions created a logjam in an already-crowded outfield, so to help ease the situation, general manager David Stearns and manager Craig Counsell approached Braun about potentially playing first base. Braun hasn’t played the infield since 2007, his first season in the majors. He was the NL Rookie of the Year after batting a team-best .324 with a league-leading .619 slugging percentage, but he committed 26 errors at third base and moved to left field the next season. Calf and wrist injuries limited Braun to 105 games last season and his numbers dipped, too. He batted .268 with 17 home runs and 52 RBIs, down significantly from the .305/30/91 he produced a year earlier. Braun didn’t have to do much rehabbing work during the offseason and reported to camp with no health issues and with the Brewers poised to challenge for a postseason berth, he’s ready for a new challenge. During his offseason workouts at Pepperdine University, Braun said he would take groundballs with Rangers third baseman Trevor Plouffe and free agent third baseman Mike Moustakas. 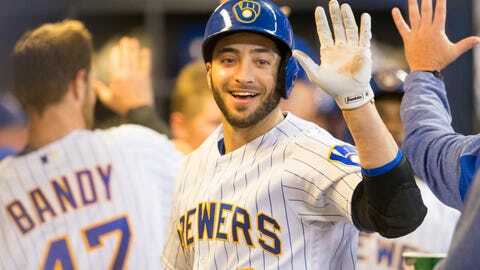 “It didn’t feel as foreign to me as I expected it to,” Braun said, adding that he plans to borrow a teammate’s glove until his own are broken in and that he’ll seek out others for advice on playing the new position. “I’ll talk to guys who have played other positions and obviously the coaches about what it takes and giving me a crash course,” he said. Determining how Braun would balance time between the outfield and first base is still a work in progress. So is the plan for him during spring training. Braun has traditionally waited until late in exhibition play to take the field but could see more action this season to ease the transition. Even if Braun takes to the new position, the Brewers will still have plenty of questions left to answer not only in terms of their outfield rotation — which also includes Keon Broxton and Brett Phillips — but at first base, too. Eric Thames will return as the regular starter after a streaky, but successful return to the majors. Counsell used Thames and Jesus Aguilar in a left-right platoon last season with positive results and could do the same with Thames, a left-handed hitter, and Braun. That would seemingly leave no room for Aguilar, who batted .249 with 16 home runs and 52 RBIs in 133 games last season but is out of minor league options.